Drivers heading to Portsmouth have been warned to avoid the area after an A27 collision left a motorcyclist fighting for his life and closed a carriageway. A 50-year-old man has been flown to hospital with multiple life-threatening injuries after a collision on the A27 in Portsmouth at around midday today. 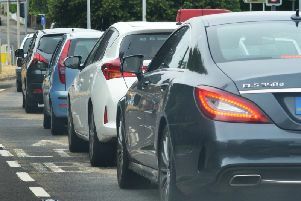 The eastbound carriageway after the M275 junction remains closed with traffic queueing for several miles. Emergency services are at the scene and the Hampshire and Isle of Wight Air Ambulance landed earlier this afternoon. A spokesman from South Central Ambulance Service (Scas) said: ‘We were called at 12.08pm to a serious collision involving a motorcycle. ‘The male rider, in his 50s, has sustained multiple, life-threatening injuries. ‘We sent a rapid response vehicle, two ambulances, an officer and the air ambulance to the scene. A statement from Hampshire Constabulary said the road was likely to be closed for some time. It added: ‘We are currently dealing with a serious road traffic collision on the A27 in Portsmouth. ‘Officers were called to the scene at 12.10pm and as a result of the incident the eastbound carriageway is currently closed. Long delays are expected and all drivers are being urged to avoid the route. The A27 has now reopened and traffic is slowly clearing.